Moon is a gripping account of the dangers, the challenges, and the sheer determination that defined not only Apollo 11, but also the Mercury and Gemini missions that came before it. 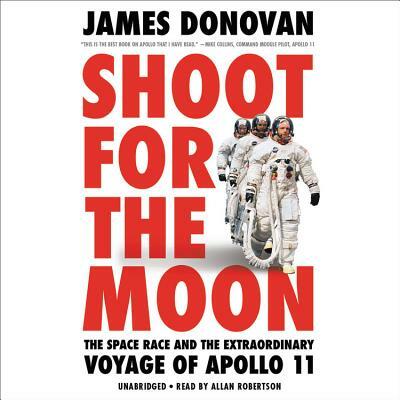 From the shock of Sputnik and the heart-stopping final minutes of John Glenn's Mercury flight to the deadly whirligig of Gemini 8, the doomed Apollo 1 mission, and that perilous landing on the Sea of Tranquility-when the entire world held its breath while Armstrong and Aldrin battled computer alarms, low fuel, and other problems- James Donovan tells the whole story. Both sweeping and intimate, Shoot for the Moon is "a powerfully written and irresistible celebration" (Booklist, starred review) of one of humankind's most extraordinary feats of exploration. James Donovan is the author of the bestselling books The Blood of Heroes: The 13-Day Struggle for the Alamo--and the Sacrifice That Forged a Nation and A Terrible Glory: Custer and the Little Bighorn-the Last Great Battle of the American West. He lives in Dallas, Texas. it all-the science, the engineering, the clashing egos, the Cold War politics. high and as far as man could go."